I work on a reward basis, that means you pay what its worth to you and what you can afford for me to come out and find your lost item...There will be a $25.00 call out fee to cover my fuel if the item isn't found. 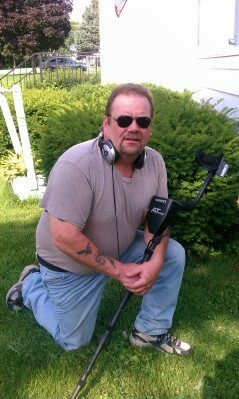 I have been metal detecting for 25 years I am a treasure hunter and a professional metal detectorist. Call from Doug on Saturday said he had lost his gold wedding band doing landscaping. It must have been my lucky day I found his ring in 5 min. I received the call Saturday August 5th,2011 and met with Carissa and she explained how she lost her engagement ring on her property within 40 minuets I had found it.